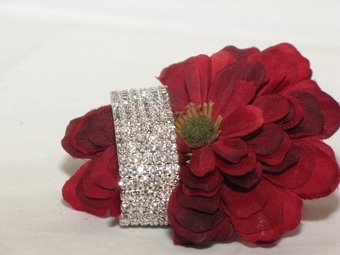 Dazzling Elegant six rows Rhinestone stretch Bracelet - SALE!! HOME / BRIDAL JEWELRY / Wedding Bracelets / Dazzling Elegant six rows Rhinestone stretch Bracelet - SALE!! Description: Dazzling Silver-Clear SIX-Row Rhinestone Bracelet, for that Hollywood look add sparkle to that special night out. Approx 1 1/2" wide. Perfect for a bride or mother-of-the-bride or bridesmaids.